Welcome to Grumpy Joe's, the UK manufacturer of portable dance floors and events furniture. Grumpy Joes Ltd is a British manufacturing company that suppliesportable dance floors, tent floors, staging, bar counters and event furnitureto the hospitality, catering and rental industries. 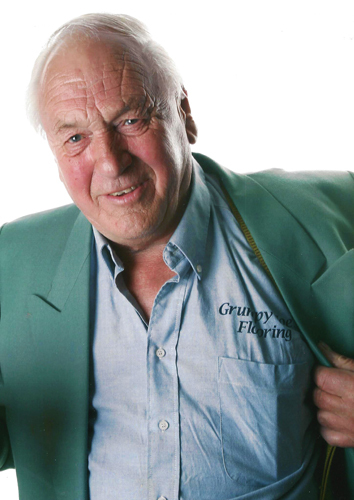 Having invented and made the first ‘no tools, no screws’ interlockingdance floors in 1974, ‘Grumpy’Joe Weston-Webb and his family business have supplied portable dance floors toall the major hotel groups for over 40 years. These have now progressedto an exciting range of wireless twinkling LED floors and Colour Commander RGBLED floors and bar counters which allow users to display text, videos,animations and images effortlessly. All of our products are designed to be easy to set up, pack away andstore, incorporating wireless connections, folding parts, tool less assemblyand custom designed storage solutions. Grumpy Joe, aka Joe Weston-Webb, was educated at Harrow School, but gave up the chance to run the family hosiery business in favour of running stunt schools for girls. Promoting The Greatest Show on Earth; shooting girls from cannons and catapults, touring the world with zany stunt shows, wrestling crocodiles, promoting pantomimes etc. He was well known for running unusual, outdoor family fun days at Bank Holidays every year attracting twenty thousand plus visitors. Stunts such as shooting his wife, Mary, over rivers from a cannon and catapult, jumping rivers with cars, motorbikes and buses and crazy car jumping and rolling competitions were his forte. Joe’s first attempt at business was selling hot dogs and burgers, with a side line goldfish fairground stall. This developed into taking photos at horse shows and renting out sound and lighting equipment as Multi-Hire Entertainment Services. This company grew to also rent marquees and décor servicing parties all over the UK. To break the monotony, he presented goldfish racing, dog swimming races, mixed domestic pet races (handicapped based on girth to inside leg measurements) and toured human cannon, motorbike and car stunt teams and a mud wrestling show to galas on summer weekends. He gained his boat master’s licence; he entertained up to 70 guests on the river Trent each night on his hilarious trip boat. This had controlled explosions in the engine, leaks, and at least one crew member overboard on every trip. As far as we know, he is the only captain actually banned from a stretch of navigation, accused of bringing trip boats into disrepute. The boat was fully booked for two years as the word of mouth spread about this zany night out. On the more serious side, in 1989, Joe designed and manufactured Florlok parquet dance floor, Weblok boarded tent floor, and Publok black and white acrylic dance floor. These are now the industry standard portable floors, and are used extensively worldwide. His family business, Grumpy Joes Ltd, continues to manufacture improved versions of all these floors. They have been copied extensively, but we still make the best products at the best prices, all manufactured to Joe’s high standards in the UK. As you can see, the product range has been increased and updated to include stages, bar counters, furniture, flight cases and trolleys, with an emphasis on wireless, remote controlled LED products. Joe's motto was 'Flooring is Boring'. With Mary, he has been making portable floors since 1976. He semi-retired in 2003 and moved to Orlando, Florida, selling flooring but also opening Fiasco's, the zany alternative and very amusing comedy dinner show. This was a successful comedy and circus show, ‘Where dining meets Disaster’; a night of fine dining, ruined by staff and technology. Joe and Mary returned to the UK in 2006 to find he had lost his business and trademarks to a company now owned by an American. He became Grumpy Joe and formed this business to manufacture his portable floors and re-establish his company as the best and the original. Grumpy Joe sadly died in June 2012 after a very short illness. His wife Mary and son Jody decided to continue his legacy and keep the family business running under his name. All our products were originally designed and made by Joe, with Jody adding the electronic and technical input to all the LED products. In addition to family members and long-serving, loyal friends, we now also employ expertise in CAD design, CNC programming, software development, an in-house woodwork and metalwork department and spray and powder-coating booths. We manufacture everything on site, enabling us to meet tight deadlines and maintain our long-held promise to always deliver on time.